Sandwich ELISA analysis of Human CD40 binding using Mouse anti Human CD40 antibody, clone 3B2 ( MCA2788GA ) as a capture reagent and biotinylated Mouse anti Human CD40 antibody, clone LOB7/6 ( MCA1590B ) as a detection reagent with purified Human CD40 as antigen for the generation of the standard curve. Detection is by HRP conjugated streptavidin. Microtitre plate is read at O.D. 450 nm on the Bio-Rad iMark Microplate Absorbance Reader ( Bio-Rad Catalog 168-1135 ). Undiluted serum and plasma samples are shown green and orange respectively. Cell Proliferation Induced by CD40 Ligand/TNFSF5 and Neutralization by Human CD40/TNFRSF5 Antibody. 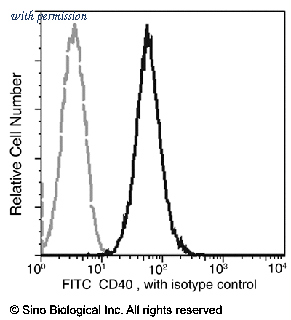 In the presence of Recombinant Human IL-4 (Catalog # 204-IL ), Recombinant Human CD40 Ligand/TNFSF5 (Catalog # 6245-CL ) stimulates proliferation in human B cell enriched peripheral blood mononuclear cells (PBMC) in a dose-dependent manner (orange line). Proliferation elicited by Recombinant Human CD40 Ligand/TNFSF5 (10 ╡g/mL) is neutralized (green line) by increasing concentrations of Human CD40/TNFRSF5 Monoclonal Antibody (Catalog # MAB6322). 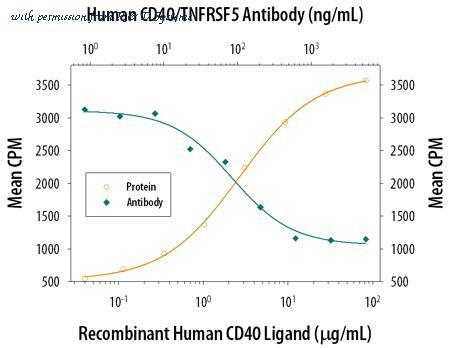 At 5 ╡g/mL, this anti-hCD40 antibody will neutralize approximately 80% of Recombinant Human CD40 Ligand/TNFSF5 -induced proliferation in the presence of Recombinant Human IL-4 (20 ng/mL). CD40/TNFRSF5 in Human PBMCs. CD40/TNFRSF5 was detected in immersion fixed human peripheral blood mononuclear cells (PBMCs) using Mouse Anti-Human CD40/TNFRSF5 Monoclonal Antibody (Catalog # MAB6321) at 10 ╡g/mL for 3 hours at room temperature. 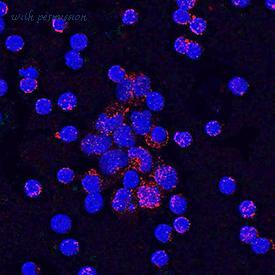 Cells were stained using the NorthernLightsÖ 557-conjugated Anti-Mouse IgG Secondary Antibody (red; Catalog # NL007 ) and counterstained with DAPI (blue). 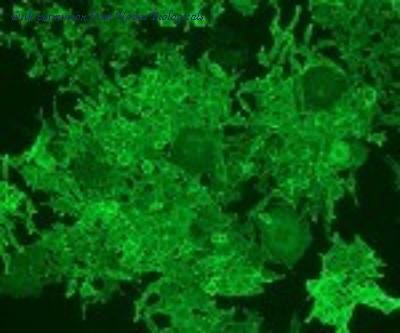 Specific staining was localized to cell surfaces and cytoplasm. 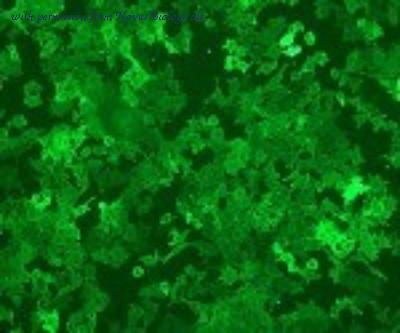 View our protocol for Fluorescent ICC Staining of Non-adherent Cells . Detection of Human CD40/TNFRSF5 by Western Blot. Western blot shows lysates of Raji human Burkitt's lymphoma cell line and Daudi human Burkitt's lymphoma cell line. 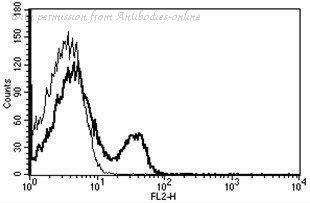 PVDF membrane was probed with 2 ╡g/mL of Goat Anti-Human CD40/TNFRSF5 Antigen Affinity-purified Polyclonal Antibody (Catalog # AF632) followed by HRP-conjugated Anti-Goat IgG Secondary Antibody (Catalog # HAF017 ). A specific band was detected for CD40/TNFRSF5 at approximately 40-45 kDa (as indicated). This experiment was conducted under reducing conditions and using Immunoblot Buffer Group 1 . 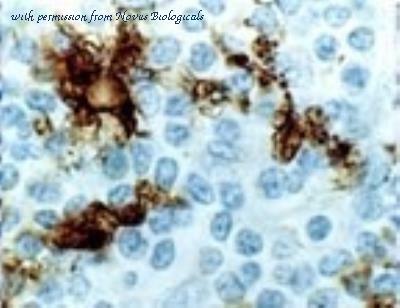 Anti-CD40 antibody IHC of human spleen. Immunohistochemistry of formalin-fixed, paraffin-embedded tissue after heat-induced antigen retrieval. Antibody dilution 1:100. 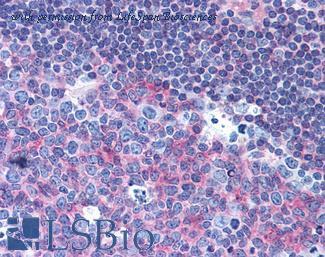 Anti-CD40 antibody IHC of human tonsil. Immunohistochemistry of formalin-fixed, paraffin-embedded tissue after heat-induced antigen retrieval. Antibody concentration 10 ug/ml. Immunocytochemistry/Immunofluorescence: CD40/TNFRSF5 Antibody (mAb89) [DDX0131P-100] - CD40-transfected L cells stained. Immunocytochemistry/Immunofluorescence: CD40/TNFRSF5 Antibody (G28-5) [DDX0130P-100] - CD40-transfected L cells stained. 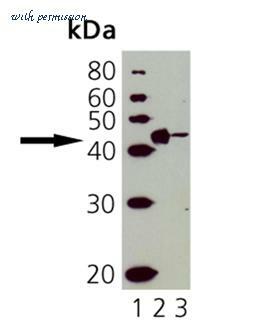 The CD40 antibody from Proteintech is a rabbit polyclonal antibody to a recombinant protein of human CD40. This antibody recognizes human antigen. 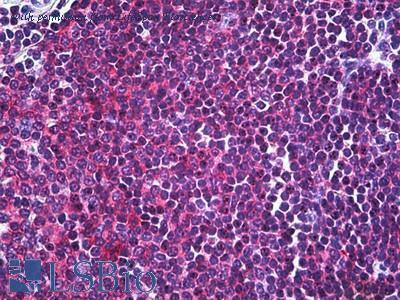 The CD40 antibody has been validated for the following applications: WB, ELISA analysis. 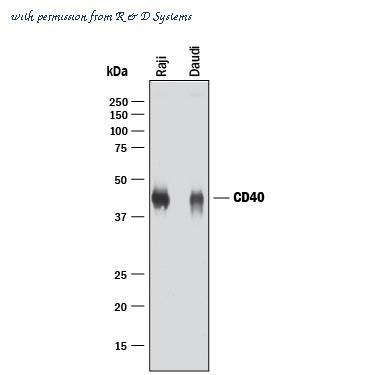 The CD40 antibody from Proteintech is a mouse monoclonal antibody to a recombinant protein of human CD40. This antibody recognizes human antigen. 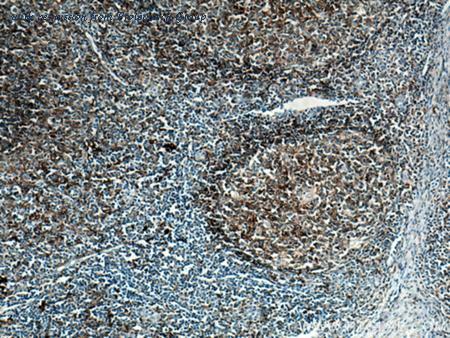 The CD40 antibody has been validated for the following applications: WB, ELISA analysis. Western Blot Analysis of CD40: Lane 1: MWM, Lane 2: ESK4 cell lysate, Lane 3: Molt 4 cell lysate. 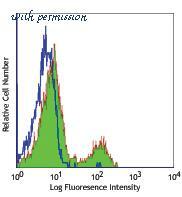 Profile of CD40 reactivity on Daudi cells analyzed by flow cytometry. Cells should be Fc-blocked by treatment with 10 ?g of human IgG/106 cells for 1 hour at 4? prior to staining, washed, then stained with FITC Mouse anti-CD40 (MM03).